CL1396 / SRP1 Moulded Molded in black polypropylene plastic. Other colours colors are available on request. Designed to allow a flush mounting on the front of a cabinet for our S2 and S4 jack sockets. 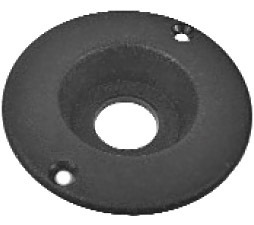 This recess plate can also be used for lamps and switches etc. for enhancing the external appearance of cabinets and entertainment equipment. Made with a matt, non reflective finish. SRP-2A Designed to accommodate a wide variety of input and output connectors. The standard version includes a pair of holes on 19.05 mm centres centers which allow the fitting of one pair of insulated terminals such as our TPP3, 4 or 5. The mounting distance is 24 mm so any suitable PCB mounting components can be used. 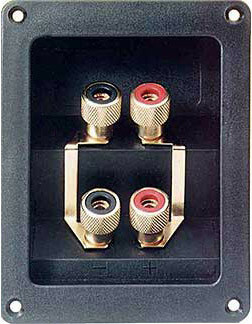 It is possible to fit jack sockets, XLR, CliffCon® or phono connectors with, or in place of terminals. The plate can also be punched or drilled if necessary. There are many possible options. Please contact our sales department to discuss your requirements. 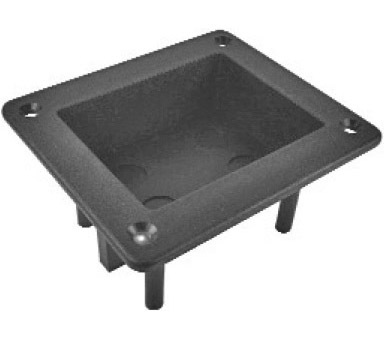 HFRP This terminal recess plate is useable in all types of Hi-Fi speaker cabinets. Solid brass gold plated terminals. Rated 30 A minimum. Crossover can be mounted at the rear; vertical or horizontal. Versatile rear tag. PC mounting or ¼″ push-on receptacle. Terminals are flush with surface. Alternative Cliff™ terminals can be fitted. CL2150 HFRP01 Hi-Fi recess plate without biamp strips. CL2151 HFRP02 Hi-Fi recess plate with biamp strips.